For more information on the various NICU reports or for a tutorial on how to use them, please contact info@cpqcc.org. More information on other reports available through CPQCC can be found on the HRIF Reports page. 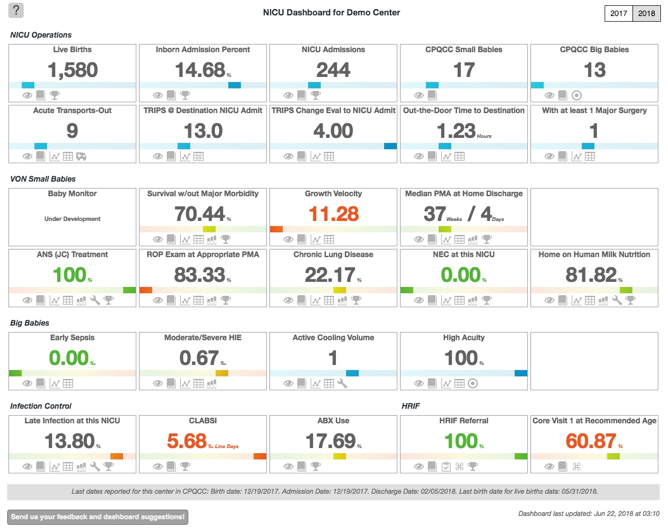 The Dashboard serves as a launchpad for quality improvement, providing a snapshot of both clinical and operational metrics for each NICU. The dashboard can be used to get a sense of areas where a unit is performing well and areas that may require further attention. 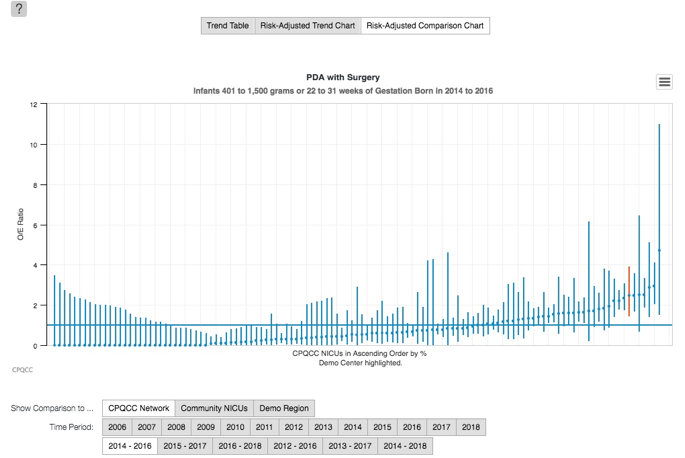 Graphs can be downloaded in JPEG or PDF formats for distribution among the NICU team or to hospital leadership. For each topic, a quantitative measure of the NICU’s current level of performance is shown. QI measures are reflected in green for NICUs performing among the top 10% in the state, and in orange for those in the bottom 10%. 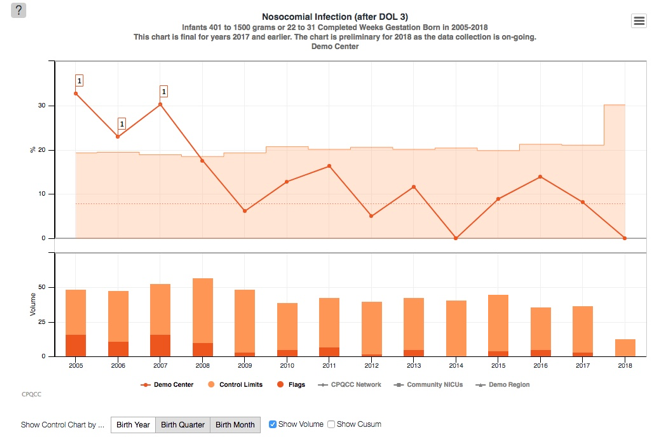 The decile bar provides a snapshot of the NICU’s performance relative to all other CPQCC centers. Hover over the icons at the bottom of each topic box for additional information. Risk-adjusted charts allow NICUs to compare their performance on individual metrics against similar NICUs (e.g. community NICUs), a region, or the state as a whole. Risk-adjusted information is available in the form of trend charts (above) and comparison charts (below). 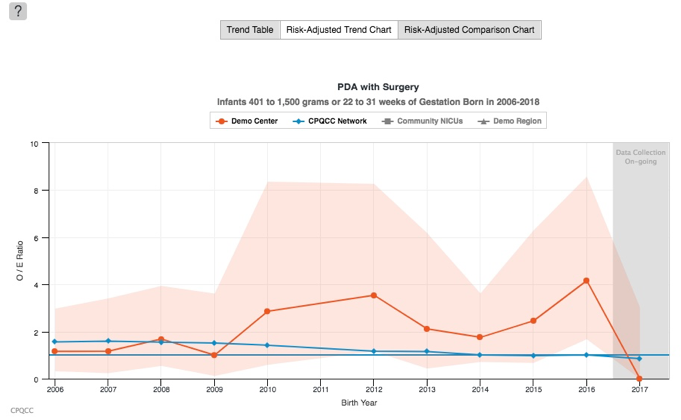 Comparison charts display one line for each NICU in the chosen comparison group, with the user’s NICU highlighted in red. The lines represent the range of data obtained from each NICU. A short line indicates low variability, and a long line indicates that there is a wide range of variability in the data from that NICU. Detail Tables allow NICUs to drill down on specific outcomes by gestational age or birth weight for each year of data entry. This allows a NICU to compare their outcomes, by quantity and by percentile, to the CPQCC network as a whole. 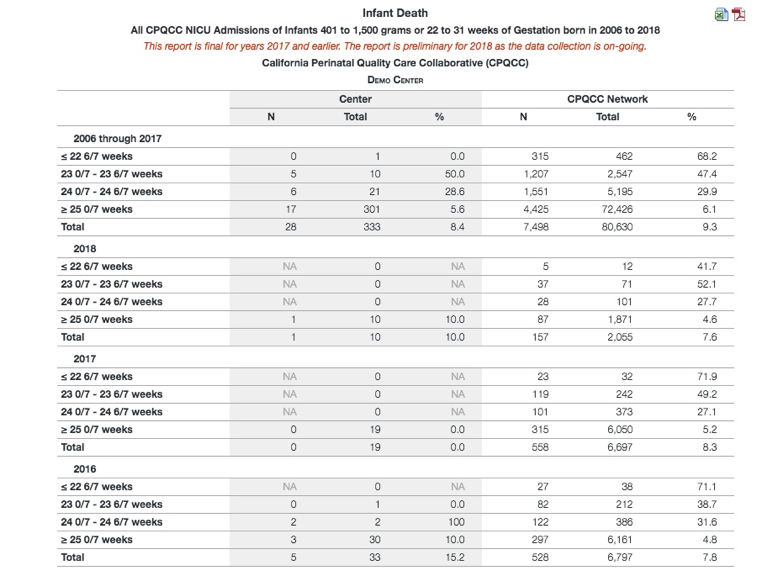 For example, detail tables could answer the question, “what percent of my NICU’s infants born at 24 weeks 0 days to 24 weeks 6 days died in a particular year and was that percentage above or below the CPQCC network percentage as a whole?”. Need more information on how to use our reports? The home page of the NICU Reports site features in-depth explanations of the various components of the site as well as the many different report and chart options available to members at the NICU and regional level, some of which are described above. You can also download this information in a PDF from the NICU Reports site. Additionally, we offer one-on-one sessions to review your center’s reports with one of our analysts. To schedule a one-on-one session email info@cpqcc.org.